Thanks so much, Nintendo. You decide to release the sequel to Final Fantasy IV on WiiWare while we're all stuck at E3? Boulder Dash! In a move that is completely not fair to me in particular, Nintendo has chosen today to release Square Enix's Final Fantasy IV: The After Years on WiiWare today, while I am sitting in a hotel room a continent away from my Wii. I would have gladly spent the 800 Wii point asking price for the game, originally released as a mobile phone title in Japan, which follows the adventures of Cecil and Rosa's son Ceodore, but now I can't, and I won't. Until I get home, when I will drop my bags just inside the door and rush to my console. Completely not fair. The rest of this week's Nintendo download is pretty fair, however. We've got Digital Leisure's Texas Hold Tournament for WiiWare (500 points), which brings online multiplayer poker to the Wii; Boulder Dash for the Virtual Console, which is a re-release of the Commodore 64 version of the game for 500 Wii points; and finally WayFoward's Mighty Flip Champs! for DSiWare (800 DSi points), which is a puzzle platformer that has nothing to do with Final Fantasy IV. So frustrated I could pee. Just look at the official descriptions. Description: Are you ready to become a Mighty Flip Champ? Take control of Alta and page-flip through a series of action-packed mazes. The touch screen reflects a preview of the next chamber and shows Alta's projected destination within it. When it's time to flip, use Alta's Magical Warp Wand to replace her world with the next one. Will she land safely on solid ground or be crushed under it? By cycling endlessly through room after brain-busting room, you'll match wits with some of the most devious traps in puzzle/platforming history. Description: FINAL FANTASY IV: THE AFTER YEARS is the sequel to the hit RPG FINAL FANTASY IV. 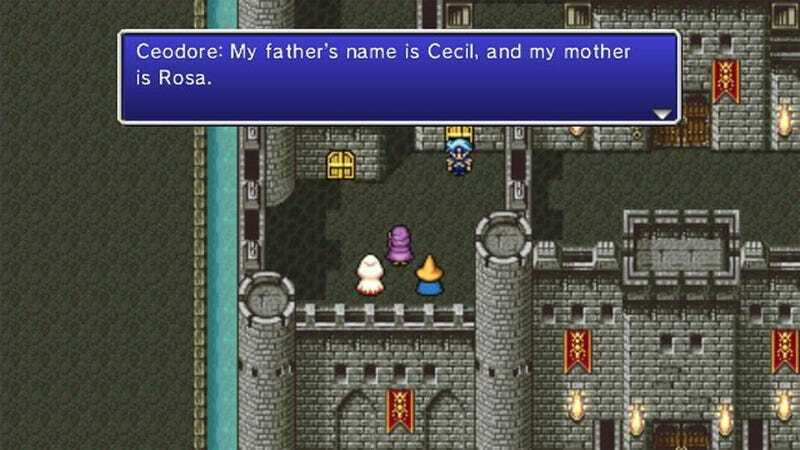 The story takes place many years after the original and centers on a young man named Ceodore, son of the paladin Cecil and the white mage Rosa, who, along with their loyal and steadfast friends, once saved the world from evil born of the second moon. Now, monsters are reappearing in a world that had finally attained peace. The second moon has returned anew. What tidings does this ominous harbinger bring? Familiar faces and new allies join the battle to save the Blue Planet once more. Description: The deck is shuffled and the blinds are in – it's your move. Call, raise or even bluff your way "all in" with Texas Hold'em Tournament. You'll start off in the small Nevada gaming halls and work your way up to the Las Vegas Championship. Multi-round, no-limit hold'em game play ensures hours of serious poker action. Think you're the best poker player out there? Using broadband Internet access and Nintendo® Wi-Fi Connection, start climbing the worldwide rankings by winning online tournaments, and see how your poker skills stack up by viewing the online leaderboard. Texas Hold'em Tournament also lets you play multiplayer poker with up to five friends, and with full Mii™ character support, you can truly bring yourself to the table. Description: Originally released in 1984, Boulder Dash is one of the big computer-game classics. It is one of the very few computer games ever to be ported from home computers to arcades, not the other way around. The hero of the game is the brave prospector Rockford. He must dig through caves to collect diamonds while avoiding various types of dangerous creatures and obstacles such as falling rocks. He is in constant danger of being crushed or trapped by an avalanche or killed by an underground explosion. Strategy and planning are the keys to mastering Boulder Dash. Once enough jewels have been collected, the door to the mysterious escape tunnel is revealed and Rockford can explore another cave.